The Libyan coast guard has saved 200 people in two rescue operations off western Libya, but found that dozens more have drowned. In a separate effort, French NGO SOS Mediterranee said it rescued another 400 migrants. At least 31 people have drowned off the Mediterranean coast near the Libyan city of Garabulli, the Libyan coastguard said on Saturday. The coastguard conducted two rescue operations and found one of the vessels three quarters under water. The patrols managed to save 60 survivors from one boat but also recovered over 30 bodies at the scene. Another 140 people were rescued from the second vessel. “When we arrived at the spot, we found an inflatable dinghy with several people clinging to part of it,” said coastguard spokesman Colonel Abu Ajila Abdelbarri. “The weather conditions these days are favourable for sending migrants to European shores on boats that are often unseaworthy,” he added. Patrol boat commander Nasser al-Ghammoudi said that the personnel searched for survivors for over five hours after locating the mostly-submerged vessel. “We were able to rescue one woman after we heard her shouts,” he said. The survivors were taken to Tripoli, where they were provided with food, water, and medical care, the authorities said. Other rescue operations were also underway on Saturday. Later in the day, the French NGO SOS Mediterranee said it had rescued over 400 people from a stricken wooden boat in international waters, who were apparently sailing from Libya. The Mediterranean Sea remains “by far the world’s deadliest border,” according to a UN study published on Friday by the International Organization for Migration (IOM). Official data says that almost 3,000 migrants have died trying to reach the EU this year. Libya is torn by fighting between rival governments, but also between rival smuggling gangs and militias that have grown powerful in the power vacuum after the overthrow of Moammar Gadhafi in 2011. 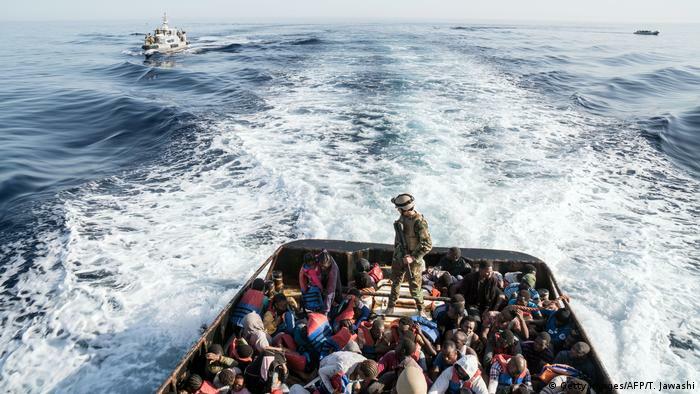 While heading to Europe across the Mediterranean might prove to be deadly, migrants rescued by Libyan coast guard often face degrading conditions in migrant detention centres. Many of them show traces of dehydration, violence and torture. Last week, UN human rights’ chief Zeif Ra’ad Al-Hussein said it was “inhuman” from the EU to back Libyan authorities in their bid to cut the migrant routes and return the refugees to “horrific” prisons in Libya. US media recently reported on Africans being sold as slaves in Libya. In response, Libya’s UN-backed unity government said it would form a “commission to investigate these reports in order to apprehend and bring those responsible to justice.” The officials also added that Libya is “a victim of illegal immigration, a transit state, not its source.” The authorities estimate that almost 20,000 migrants are currently housed in detention centres. Meanwhile, on Saturday, Italian Prime Minister Paolo Gentiloni met with Tunisian President Beji Caid Essebsi and Prime Minister Youssef Chahed to discuss the anti-jihadist efforts in the region and the migrant issues in the neighbouring Libya. « Zuma Fails To Show At 16 Days Of Activism Launch -Because Of Non-Attendance – End Of Zuma????? ?